The vast majority of David Bowie's 1970-1971 performances were played with Hype, who consisted of: David Bowie (vocals, guitar, electric piano), Mick Ronson (lead guitar), Tony Visconti (bass guitar) and John Cambridge (drums). Mick 'Woody' Woodmansey would eventually replace John Cambridge on drums on 30th March 1970. *8th Jan: David performs a late night spot on his 23rd birthday. The Speakeasy performance had Tony Visconti (bass guitar), Tim Renwick (guitar) and John Cambridge (drums) as David's backing. The set included songs from his current album and also 'Port Of Amsterdam', 'Buzz The Fuzz', 'Fill Your Heart' plus a few Mason Williams poems. *14th Jan: The Old Downham Folk Club merged with the South East London Tech Folk Club to form this new venue. David made a guest appearance alongside The Gasworks, Ralph McTell and Marc Ellington. *18th Jan: David's interest in the Arts Lab around this time was beginning to wane. Some of his performances do exist on tape. Chas Lippeatt, who handled the Arts Lab PA system and film unit used to tape record the evenings music for a free lending library sponsored by the Lab. *3rd Feb: The Marquee Club performance had Tony Visconti (bass guitar), John Cambridge (drums) and Tim Renwick (guitar) as David's backing band. Support band Junior's Eyes, who Renwick and Cambridge were part of, make their final appearance before splitting up. Special guests that evening were The Time Box. *5th Feb: Mick Ronson's debut performance with David. Along with Tony Visconti and John Cambridge, they record four songs for John Peel's radio show 'Sunday Show' Concert, which was broadcast on the 8th, except the final number 'Memory Of A Free Festival'. *22nd Feb: The Roundhouse Spring Festival opened on the Sunday with David Bowie on the bill, along with Bachdenkel, Groundhog and Caravan. In reality this was the first live performance of David's new band Hype. This performance was filmed and recorded. *23rd Feb: Hype play one gig in Streatham under the pseudonym of 'Harry The Butcher'. *28th Feb: Hype are billed as 'David Bowie's New Electric Band' at the Basildon Art Labs experimental music club at the Basildon Arts Centre in Essex. Also on the bill were High Tide, Overson and Iron Maiden. Strawbs were due to perform but were replaced with the first live appearance of David Bowie's New Electric Band - so new they haven't got a name yet! 19th The Three Tuns Public House Beckenham England - Arts Lab/Solo Perf. *27th April: Stockport Schools' Union Sixth Form concert organised by Stockport Grammar School featuring David Bowie and Hype, Barclay James Harvest, High Tide and The Purple Gang. 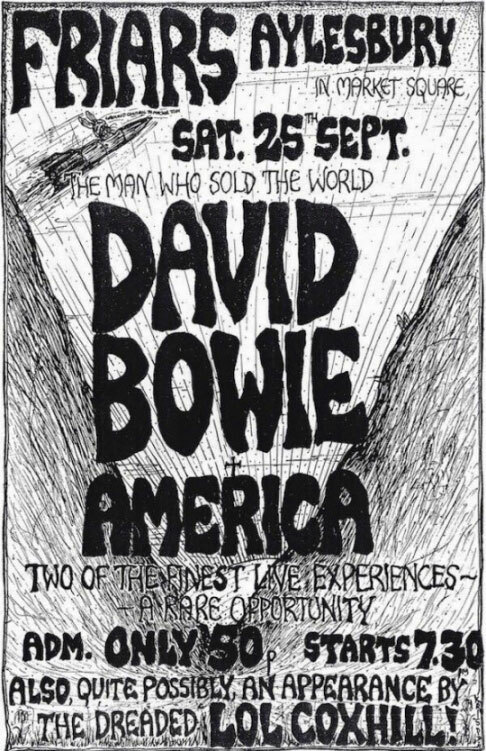 David ended up performing this gig solo as drummer Woody Woodmansey had injured his finger. David asked The Purple Gang to back him, but they bottled out. David unfortunately missed the last train back to Euston after this gig, and ended up sleeping in Stockport Railway Station. *10th May: David was awarded an Ivor Novello Award for Best Original Song 'Space Oddity', which he performed that night accompanied by the Les Reed Orchestra. The event was transmitted live via satellite to over 60 closed-circuit outlets in America, including New York's Carnegie Hall. It was also seen in France, Spain, Australia, Holland and Venezuela, but not Britain, where it was broadcast live on Radio 1 and 2 at 10pm-11.30pm. 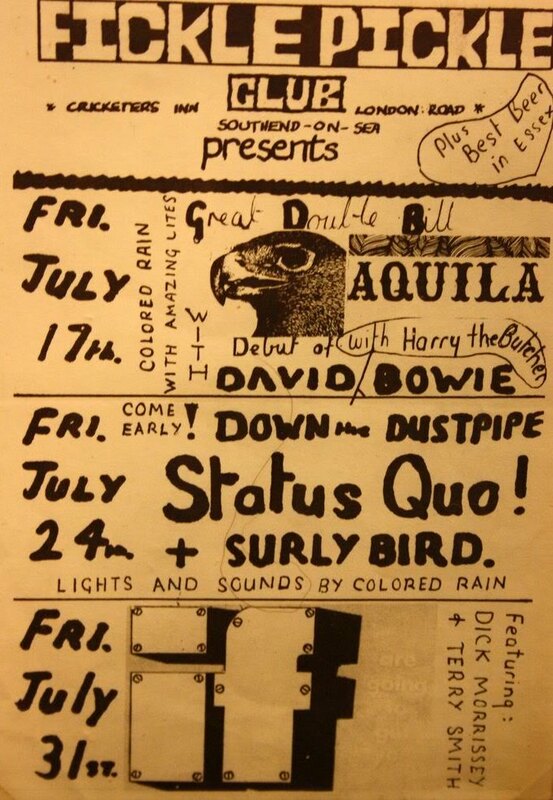 *17th: Billed as David Bowie with Harry The Butcher. 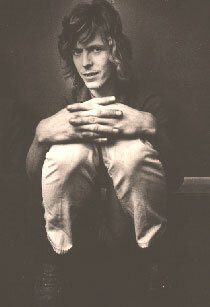 *27th: Billed as 'Dave' Bowie. *1st: The Eastwood Free Festival held on Eastwoodbury Lane, was organised by Blackhill Benefit for Release. Artists included: Edgar Broughton Band, Michael Chapman Band, David Bowie, Surly Bird, Roger Ruskin Spear and Formerly Fat Harry. *20th-24th June Glastonbury Fair: David was scheduled to play on Tuesday 22nd between 7.30pm and 8-30pm but there was an over-run by the preceding bands. David finally took to the stage at dawn. His set was 'Oh You Pretty Things', 'Kooks', 'Changes', 'Amsterdam', 'The Supermen', 'Memory Of A Free Festival' and 'Song For Bob Dylan'. After David's performance 'Accrington Stanley' were the next act. *25th September Aylesbury: David performs for the first time with all three Spiders: Mick Ronson, Mick 'Woody' Woodmansey and Trevor Bolder. Also Tom Parker (ex The Animals) joins the band on piano. Support band America cancelled. Read the transcription of the show. *During November, David and his new band, later to be named The Spiders start rehearsals at the Underhill Studios, 1-3 Blackheath Hill, Greenwich, South East London SE10 8PB.